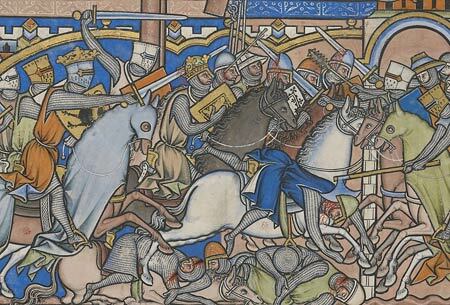 The spectacular Crusader Bible is one of the greatest illuminated manuscripts in the world, renowned as much for its unrivalled and boldly colored illustrations as it is for its fascinating history. The work brings Old Testament stories alive in bright images replete with castles, towns, and battling knights in armor, all set in thirteenth-century France. Before the manuscript is rebound visitors have the opportunity to view over forty of its miniatures, the work of six anonymous artists who were the artistic geniuses of their day. They also learn about the manuscript's incredible journey from France to Italy, Poland, Persia, Egypt, England, and finally, New York. The picture book, which was likely made in Paris about 1250, has long been associated with the court of Louis IX, the pious crusader king of France and builder of the Sainte-Chapelle. The book originally had no text, but along the way, inscriptions indicative of changing owners were added in Latin, Persian, and Judeo-Persian. The illuminations represent one of the greatest visualizations of Old Testament events ever made. Some of the stories are familiar, but others, more rarely depicted, are surprising. To view the entire Crusader Bible, zoom in on image details, browse English translations of the Latin, Persian, and Judeo-Persian inscriptions, and learn more about the manuscript and its rich content, visit the online exhibition. This exhibition was made possible by the Janine Luke and Melvin R. Seiden Fund for Exhibitions and Publications, the Sherman Fairchild Fund for Exhibitions, James H. Marrow and Emily Rose, and the H. P. Kraus Fund. MS M.638, fol. 23v, det. Purchased by J. P. Morgan, Jr., 1916.